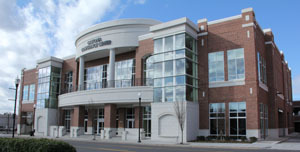 Gastonia Conference Center is a symbol; a sign of the people of Gastonia, North Carolina on the move toward civic, economic, and environmental sustainability. Designed to pay homage to the surrounding architecture and heritage of the area, Gastonia Conference Center is the premier destination for local, regional, and state-wide conferences and events, from metro-Charlotte based corporate meetings, to state-wide conventions, to local and community events, to memorable weddings. This cutting-edge, 30,000-square-foot technologically advanced and sustainably built conference center is designed to generate business and support the local Gastonia community. The Conference Center accommodates over 450 meeting attendees and 300 for a seated banquet function and features ten separate, purpose-built and distraction-free meeting rooms, event spaces and 5,100 square-foot ballroom. It has already gained recognition as the greater Charlotte region's foremost destination for events of all kinds.